I forget when exactly the news broke that Pope Francis, in fact, would be coming to Philadelphia to conclude the World Meeting of Families, but I do remember what my first thought was when I heard it "King's College will be there." King's College is a two hour drive up the Pennsylvania Turnpike from Philadelphia. It was like learning that the pope would be coming to say Mass in our backyard! Before I entered seminary with Holy Cross, I worked as a FOCUS missionary at Temple University in Philadelphia. During my first year on staff, Pope Benedict visited the United States, and the Temple Newman Center bussed up to New York to attend the public Mass in Yankee Stadium. 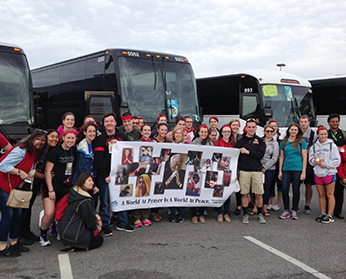 The college students flew at the opportunity to see the pope! I imagined the same sort of excitement taking hold of our own faith community here at King's. I started to see my dreams of a great, faith-stoking, papal pilgrimage go up in smoke, however, when the bus companies of the greater Northeast immediately reserved out all of their vehicles. The pope (and not just any pope, but Pope Francis of all popes) was going to be just two hours down the road, and we didn't have a way of getting there! The sour taste of anticipated regret tainted my summer months. Very close to the beginning of the Fall semester, though, a palate-cleansing call came through to the Campus Ministry offices a bus had become available from a company out of New York. We were free to plan our King's College papal pilgrimage. As expected, the students jumped on the opportunity when they arrived back on campus. 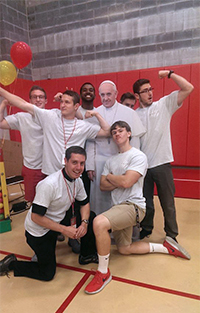 We set up a Pope Francis photo booth at the orientation carnival. We conducted a lottery for seats on the pilgrimage bus, and as providence would have it, the exact number of seats we had to allot to King's students was the exact number of lottery submissions received on time! College students being college students, though, submissions continued to roll in after the deadline, and again, as providence would have it, the exact number of students to drop out of the pilgrimage was the exact number of students who put their names down on the waiting list! I began to sense that God was choosing these specific people to receive this once-in-a-lifetime grace from his hands. The week immediately preceding the trip to Philadelphia was full of excitement on campus. The local papers were running articles about our students who were planning to go on the pilgrimage. 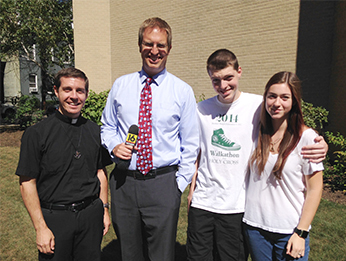 Local television and radio stations were conducting interviews to run for the evening news. I even had my first shot at live TV! The men at the prison on Saturday morning made a point of telling me, "Hey, Father, you were looking good on the tube this past week!" Actually being on the ground in Philadelphia on Sunday was surreal. For me, it was a poignant moment, because I had lived in Philadelphia for two years before entering seminary. I had made a home there. I had encountered Christ on those streets. I had found models of priesthood that I wanted to emulate. To see Pope Francis walk my streets, therefore, did something to me that I'm not sure I can quite put into words yet. His presence wove his message directly into the fabric of my own life, ministry, and identity. The grace of the pilgrimage for me, though, wasn't only seeing the Pope in my city. It was also concelebrating Mass with the Pope five months into my priesthood. I felt like my life had come full circle and was now opening onto new horizons. Vesting for Mass in the art museum, I ran into Bishop David Foley, the bishop who confirmed me back in Alabama, who first planted the seeds of a vocation in me, who I haven't seen since the eighth grade. 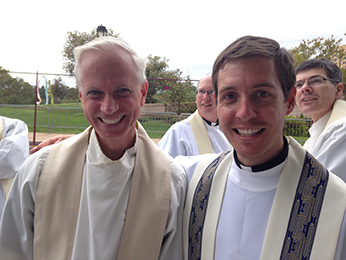 Lining up for Mass behind the art museum, I ran into Father Shawn Mahoney, my chaplain from the Temple Newman Center who wrote one of my recommendations for the seminary and who models for me, better than anyone else just about, the heart of the priesthood. Concelebrating the Mass, I was seated in the same section as the other Holy Cross priests who had been in town for the World Meeting of Families. And here I was, a priest myself, offering the same Mass as the Pope for the needs of my students, my community, my family, my city. A feeling like that is an echo of the peace that heaven holds in store for us, but as if that weren't enough, after the Mass, as we were all headed back to the art museum to de-vest and collect our belongings, the security guards stopped us to tell us that the papal motorcade would be passing by in a few minutes on its way to the airport. I got to wave goodbye and to yell out my thanks as Pope Francis' Fiat crawled by five feet away. And the students the students threw themselves full throttle into the spirit of the pilgrimage! They walked over fifteen miles getting back and forth between our parking zone and the Mass. They endured the hunt for a security checkpoint that wasn't already glutted with ticket holders. They stood for hours along the parkway fences so as to enjoy six seconds of exposure to Pope Francis as he drove by. And they prayed. They cheered. They exposed their hearts to the pastor who exposes the heart of Christ to them. Now they can say as a matter of fact and as a point of pride, "King's College was there!" We were there, with the Vicar of Christ, in the streets that Christ himself walks. Father Chase Pepper, C.S.C. was ordained a priest in the Congregation of Holy Cross on April 11, 2015 along with five of his seminary classmates. Fr. Pepper has been serving for the past year at King's College in Wilkes-Barre, Pennsylvania. He is originally from Huntsville, Alabama.